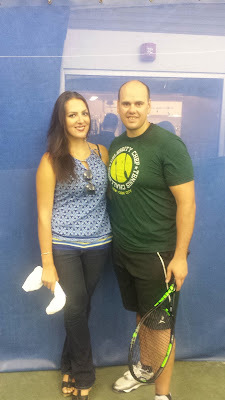 The winners of the Taste of Tennis Celebrity Chef Tennis Challenge are Chef Christian Pappanicholas and Lisa Goldstein. Photo by Yours Truly. HEADS UP: Once again, it is the week leading up to the U.S. Open. At VEVLYN’S PEN, we call it U.S. Open Tennis Week (roughly Tuesday through Saturday). Before the players get down to serious business, they do a little lightweight partying. Stay tuned, as we bring some of the action to you. The day before they serve up chow at a certain gala fundraiser, some top chefs served at court – the tennis court. The second annual Celebrity Chef Tennis Challenge – the newest dish in the growing Taste of Tennis franchise – went down yesterday morning into the afternoon at CityView Racquet Club in the New York City borough of Queens. The Celebrity Chef challenge showcases the court techniques of top chefs and sundry others. 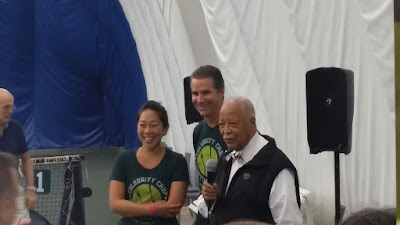 The all-doubles competition attracted serious tennis lovers, including former New York Mayor David Dinkins, a major friend of U.S. Open tennis. George Duval births the London Mule: Earl Grey Infused BULLDOG Gim, Ginger Beer and Lime Juice. Photo by Yours Truly. In its early stages, the Celebrity Chef challenge is engagingly goofy in the vein of world No. 1 men's tennis player Novak Djokovic. It is also a very informal affair as it regards the rules of the game, but the likes of Iqram Magdon Islmail (Kottu House), Samantha Davis (Savor), Marc Murphy (Landmarc), Jonathan Waxman (Barbuto), retired tennis pro and foodie forever Sarah Mayer (ContextMedia Health) as well as Admir Alibasic (Ben&Jack’s Steakhouse) were very sporting, if not all together certain of what the blazes was going on. Of course, Chef Admir can be excused for his inability to discern whether he advanced to the semi-finals. After all, the man had just returned from his Mexican honeymoon – at midnight. “And we did not go to bed until 3 a.m.,” his tired, but happy wife, Hana disclosed. Alas, Chef A did not advance, but Lisa Goldstein (LI Tennis Challenge Winner) and Christian Pappanicholas (Resto /Cannibal) did. 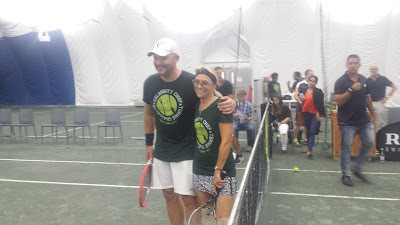 At the end of the day, or rather around noonish, that doubles team emerged the winner (4-3, 40-30) of the Celebrity Chef Tennis Challenge over Juan Santamaria (event guest) and Jeff Lefcourt (Co-founder of The Smith). (See video above). For their efforts, the duo won a trip and some steaks. The runners-up walked away with Breville. product. After the victory, the gathering repaired upstairs for an awards luncheon. Players and guests were watered with BULLDOG Gin speciality cocktails prepared by self-described humble barkeep of Open Bar Hospitality, George Duval (http://www.openbarhospitality.com), Rose and Sauvignon Blanc from Mouton Cadet and specially named Goose Island beer (Matilda and Sofie). The Newlywed Alibasics: Chef Admir and Hana. Photo by Yours Truly. 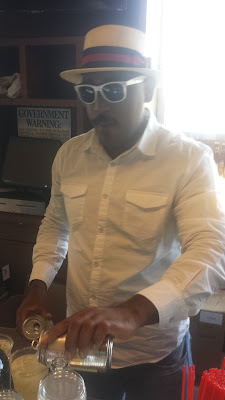 For the feeding, Master Purveyors set out Prime Original Blend Burgers and Kobe Beef Hot Dogs. On the side, Ben & Jack’s Steakhouse placed Mac&Cheese, Mixed Greens and German Potatoes. And strictly for tasting: Prime Dry-Aged Sirloin, Bella Bella Fois Gras (sausage), Brooklyn Cured All-Natural Chicken Apple Sausage, Lamb Merguez Sausage and Duck Fennel Sausage. Lastly, North Country Smokehouse Bacon. The business was taxing on the whole, but all muddled through. And all of the losers can redeem themselves at the Taste of Tennis Gala, ToT's jewel in the crown. Michelle Yu of SNY, Chef Kerry Heffernan (Grand Banks) and former New York City Mayor David Dinkins. Photo by Obed Cepeda. 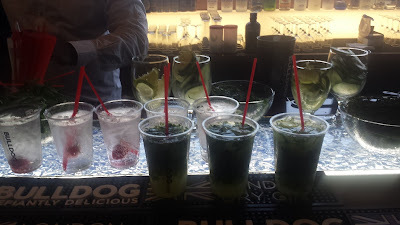 The BULLDOG Gin Raspberry Thyme G&T and the Herbaceous Lemonade, featuring thyme and cilantro. Photo by Yours Truly. Actor Kevin James and Maria Sharapova make a winning doubles team at the "American Express Rally on the River." Photo courtesy of Getty Images. As promoted, it was a spectacular water and light show last night at Manhattan's Hudson River Park at Pier 97 for the "American Express Rally on the River." To say VIP card members were impressed is an understatement. Light and water weren't the only impressive elements. Keeping the crowd in a groove was the Montreal-based electro-funk duo Chromeo. Sometimes sporting racquets were John Isner, Monica Puig and Maria Sharapova. The latter, the world No. 2 women's tennis player and the highest paid female in sports, was also nominally celebrating her new AMEX partnership, "You vs. Sharapova." The interactive game is a major part of the "American Express Fan Experience" at this year's U.S. Open. On a clear night with a gentle breeze, AMEX presented a "first-ever" hydro-interactive tennis experience, featuring legends who were there, yet not there. Words don't quite capture it. To that end, enjoy the video. Visit http://www.americanexpress.com to learn more about “Rally on the River,” “You Vs. Sharapova and other tennis-related American Express initiatives.